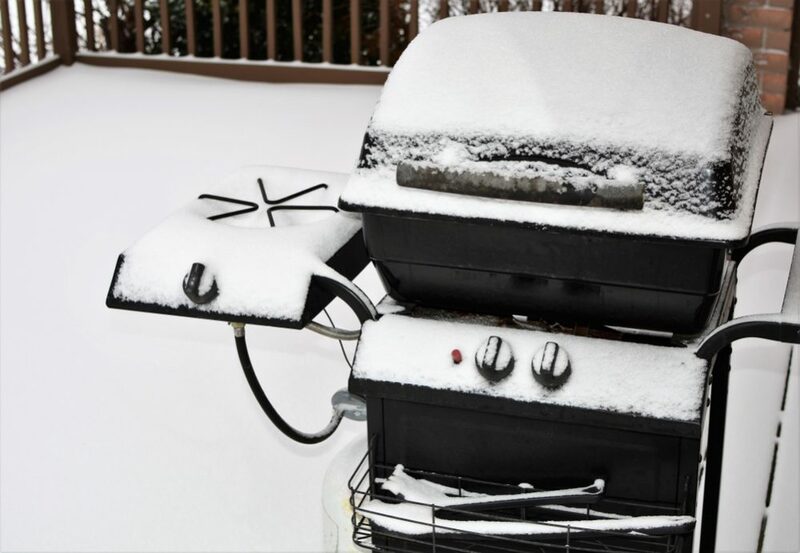 If you’ve invested in an outdoor grill, you’ll want to protect it from the elements. To do that, you need a grill cover – but which one should you choose? Here we take a look at the best grill covers on the market today. And tell you how to find the one that will best meet your needs. What conditions will your grill cover have to cope with? Ready to buy your grill cover? The sun’s out and your garden is looking great. What better way to celebrate than with a barbecue! But what happens when you get out your grill and discover it’s covered in rust? We’ve unfortunately found ourselves in that position more than once. Where we live, we have long winters when our grill never sees the light of day. And with lots of rainfall, there’s plenty of time for rust to develop before the sun comes out again. After having twice had to abandon barbecue plans because our grill wasn’t fit for use, we decided to take action. We’d invested in a new gas grill, and it had cost a lot of money. We were determined it wouldn’t meet the same fate as its predecessors! 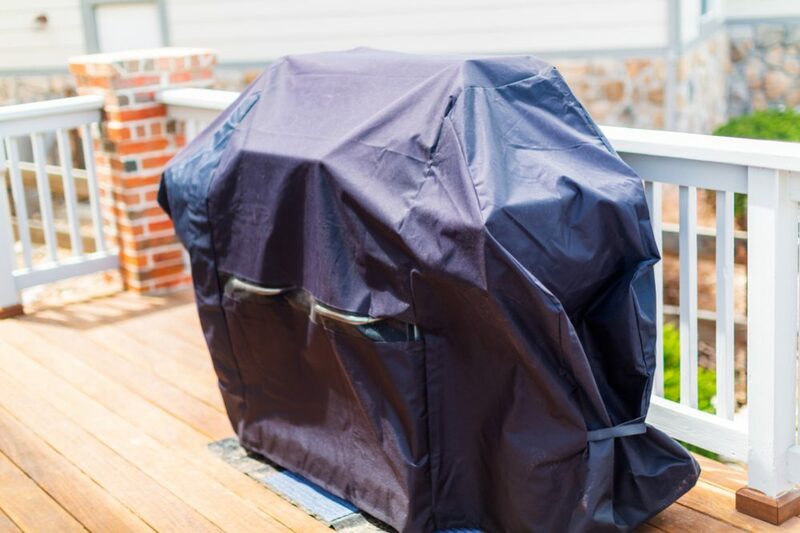 A bit of internet research showed us the answer: a grill cover. It seemed like the perfect solution to keep the rain away from our metal grill. And what’s more, it could be used in the summer too to stop the grill getting dusty. So we headed to the shops. Unfortunately, though, we hadn’t done our research! Who knew that there were so many covers to choose from? Overwhelmed by the choice, we just picked the first one that came to hand. Stories like that usually don’t end well – and this one is no different. We got home to discover that our lovely new grill cover had all the features we could want. There was just one problem: it didn’t fit our grill! That’s a rookie error, right? But there are other pitfalls to be aware of when choosing your cover. After that first unsuccessful buying trip, we made sure we took our time to pick the right option. Happily, you can learn from our mistakes! Here, we take you through ten of the best grill covers out there. And we’ll also tell you what to consider so that you make the right choice for your grill. This grill cover from VicTsing is available in four sizes: 58, 60, 64 and 72 inches. That means there’s lots of flexibility in this range. You’ll need to get out your tape measure to make sure you get the right size. The measurement you’re looking for is the width, and you should measure across the widest point of your grill. If you’re between sizes, go for the next one up. There are handy Velcro straps at the bottom of the cover that can be tightened to help keep it secure. It’s 24 inches deep and 48 inches high. The shape is narrower at the top where it will be covering the lid of your grill. This gives it a snug fit all over. And that, in turn, reduces the chances of the wind catching surplus fabric and causing it to rip. The design will fit most gas grills. VicTsing name Brinkmann, Weber, Jenn Air, Holland, and Char-Broil as amongst the brands it’s compatible with. The cover is made of 600D polyester, with a UV-resistant coating on top and a PVC layer underneath. The result is a tough cover that’s rip-resistant and hydrophobic – that’s water-hating, for the non-Latin speakers amongst us. The raindrops will just sit on the surface until they dry up, avoiding any moisture getting near your grill. It’s just as good at keeping off dust too. The seams are bound to stop any rainwater or dust particles sneaking in. And that top UV-resistant layer will also protect it from the sun’s rays. So if you’re lucky enough to be in an area where you get lots of sunshine, it won’t crack. There are handles on either side to help you get the cover on and off easily. They’re a big help if you’ve dashed outside to protect your grill from a sudden downpour! As for appearances, there’s nothing here not to like. The cover is plain black, with a small “grill” logo near the top. It’s easy to clean too. Just wash it over with a hose when it gets dusty and leaves it to dry in the sun. It will look as good as new. King Kong’s grill cover is designed to give a snug fit on a very specific range of grills. If you’re the proud owner of a Weber Genesis 300 Series (models E-310, E-330, EP-310, EP-330, S-310 or S-330), it should be on your shortlist. It will fit the Genesis II E-310, or any of the four-burner models from Char-Broil, just as neatly. It’s made of heavy duty materials to keep out all weathers. In this case, it’s 600D Oxford fabric, with a PVC coating. It’s hard wearing, and will stand up to both pouring rain and bright sunshine without admitting moisture or cracking. The seams are stitched with a triple needle, so there’s no danger of weak points in the cover. And because it’s manufactured with a specific grill shape in mind, it fits snugly whilst being easy to put on. There are no handles with this one – but its custom fit means this isn’t really a drawback. For extra security, there are Velcro straps that can be tightened. These sit just below the widest point of the grill. This position means there’s no extra fabric beneath the grill platform to catch the wind and tear. The trade-off is that there’s nothing to keep the cover tight at the bottom. If you’ve got your grill in a position where swirling winds could get beneath the skirt – on a deck at a high point of a garden, for example – it might not be the best option. This is another grill cover that comes in a single colorway – black. It has a “King Kong” logo positioned near the top on the left-hand side. That logo is exactly as you’d imagine it – so your views on the design will depend on how you feel about gorillas! Personally, we think it looks smart. There’s a three-year warranty with this one, so you can be confident it’s built to last. It also comes with free barbecue accessories: a pair of tongs, a cooking thermometer, and a stainless steel grill brush. They’re all solidly made, and the thermometer is nice and accurate too. Like King Kong, Homitt’s grill cover comes in different sizes. The smallest is 58 inches wide, and there are 60 and 72-inch versions too. In all cases, the cover is 24 inches deep and 44 inches tall. It fits a wide range of different grills, with a standard shape that’s wider at the bottom than the top. That’s to take account of the way that most grills have food preparation platforms beside the cooking area. The narrower section means the cover fits neatly against the sides of the grill lid. Unlike King Kong, this one comes with handles. There are two, one either side of the sloping section that covers the grill lid. This makes it easier to get a grip when you’re putting the cover on and taking it off. The fabric is 600D polyester with a PVC coating. It’s waterproof and dust-proof. And there’s also a UV coating to cope with bright sunshine. This is genuinely a grill cover that will stand up to all weathers without ripping or even losing its color. There are Velcro straps to keep the cover secure. These are positioned just beneath the grill platform, holding it in place at the widest point. The bottom sits just above the floor, but again there’s nothing to tighten the lower edge. The logo is positioned in exactly the same spot as with King Kong. In this case, however, it’s a little more understated. It simply features the word “Homitt” in white inside a white border, making it pretty unobjectionable to all tastes. You’ll also get some extras with this cover. It comes with its own carry case, so you can keep it neat when it’s not in use. And there are free barbecue accessories too – a grill cleaning brush and a cooking thermometer. That thermometer will cope with an impressive temperature range of between 58 and 572 degrees Fahrenheit. You can also choose to measure in Celsius if you prefer. And it has a 5.5-inch probe, so you can measure the internal temperature of even thick joints of meat. The grill brush is stainless steel and robust enough to cope with the toughest cleaning challenges. All in all, this is a good quality cover at a reasonable price. In appearance, there isn’t much to distinguish this grill cover from many of the others on our list. It’s plain black and logo-free, making it a good choice for those who like minimalist design. It’s shaped to fit snugly over standard gas grills, with a narrower section to fit over the grill lid. There are, though, an impressive range of features which make this cover a good candidate for consideration. It’s constructed of two layers: PVC outside and vinyl inside. This makes it waterproof and resistant to UV rays. Expect it to last months without fading, even in strong sunshine. The seams are tightly stitched to keep out moisture and dust. There’s a handle on each side to help you maneuver the cover easily into place. They’re also a useful feature when the cover isn’t in use, providing hooks for hanging it up. At 42 inches tall, the cover is a little shorter than some. It’s not intended to cover the wheels of the grill. That’s for two reasons. Firstly, it makes it easier to move the grill with the cover in place. And secondly, it avoids the cover freezing to the ground and ripping in cold weather. That means, though, that there could be a problem if the wind gets under the bottom of the cover. UNICOOK have dealt with this by placing 1.5 inch wide straps near the bottom edge. These are fastened with Velcro to keep the cover in place and prevent splashes wetting the bottom of the grill. A particularly nice touch is the structured vents at the sides. These allow air to circulate, allowing moisture to escape. This will stop mildew from forming on your grill. The air flow will also help prevent the cover catching in the wind and blowing away or tearing. If all that wasn’t enough, this cover also comes with a 90-day money-back guarantee and 12-month warranty. If you want a cover to look stylish while protecting your grill, this one from Classic Accessories fits the bill. It comes in an attractive shade of cream, with a taupe band at the bottom to hide splashes. There is a host of matching covers too, allowing you to coordinate the protection of your patio furniture. And if you want to check the color, you can order a free fabric swatch. It comes in no fewer than eight different sizes, from extra small to extra, extra, extra large. The widths range from just 38 inches to a massive 80 inches. So however big or small your grill, there should be an option to suit. Make sure you check the depth and height, though, as these vary slightly too. The extra small cover is 22 inches deep, whilst the XXXL is 26 inches deep. And the heights range from 44 to 51 inches respectively. The shape will fit most standard gas grills. Anything made is Weber, Jann Air, Char-Broil or Brinkmann should be a neat fit. The fabric is woven polyester with a laminated backing and that backing is made without any harmful chemicals. Bound seams give the cover strength, and there are tightly stitched hems to keep it weatherproof. It doesn’t claim to be UV-resistant, though. We’ve heard stories of people in areas of high sunshine having problems with the fabric cracking. If you live in a similar area, look for a cover with a UV-resistant finish for longer life. This is another cover that comes with handles on either side. They really do make it much easier to take the cover off and put it back on again. A particularly nice feature of these handles is the addition of padding for comfortable use. There are no Velcro straps with this cover, but that doesn’t mean there’s no way of tightening it. Instead, the bottom hem is elasticated, with toggles to keep it pulled tight to the legs of your grill. Because the elastic goes all the way around the bottom, it’s a really effective way of keeping the cover tight. All in all, this is a good choice for style-conscious grillers in areas that don’t get exceptionally strong sunshine. And you’ll get a three-year warranty with your purchase. This neat grill cover from Felicite has a whole pile of clever design features. Let’s start with one area that’s not so remarkable: its looks. This is a plain black grill cover shaped to fit a standard grill. It’s 58 inches wide by 24 inches deep and 48 inches tall. There’s a neat logo on the front reading “Garden Home Outdoor” in yellow. There’s nothing here to light your (grill) fire, but it’s attractive enough. There’s a large front pocket secured with a zipper. It’s just as waterproof as the rest of the cover, making it a handy place to store a few accessories. On either side, there are straps to keep the cover fitted tightly. These straps have buckles, which will keep them securely in place in all weathers. Two at the bottom hold the cover tight to the legs of the grill. And unlike most other covers, there are another two straps further up. The 48-inch length is longer than the majority of grill covers, certainly of this width. For most 58 inch wide grills, it will mean the cover touches the floor. While that does mean you won’t have an issue with splashes, the fabric can freeze to the ground in cold weather. If that may be a problem in your area, check the cover has fully thawed before trying to move it. Otherwise, you may find it tears. This is another cover to benefit from having padded handles to make it easy to put on and remove. But our favorite features are the air vents at either side. These are angled downwards, so you don’t need to worry about them admitting moisture or dust. But they do allow air to circulate, protecting your grill from mold and mildew. This is one of the least expensive grill covers on our list, but the quality is great. You get a decent design, four straps with buckles, air vents and padded handles. And the fabric is as heavy duty as covers costing twice as much or more. All that, and we’ve heard good things about Felicite’s customer service too. If you have a 58-inch wide gas grill, this should be on your shortlist. All the covers on our list so far have been for standard gas grills. So we thought we’d mix things up by including this cover for built-in versions. 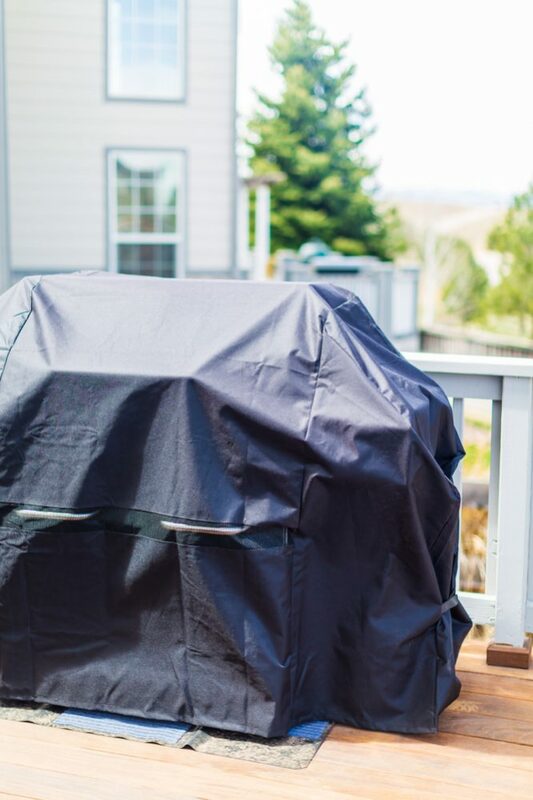 The Ravenna from Classic Accessories is a good-looking grill cover. It sits on top of the grill so you can still get to the cupboards underneath. But it still covers up all the grill controls to protect them from the elements. It’s styled in a classy taupe, giving it a distinctive look. There are no big logos to spoil its clean lines, just a neat black label reading “Ravenna”. It’s discrete enough to be a style statement of its own. The cover is made of a fabric called Gardelle One. It’s a resilient woven polyester with a laminated backing and UV-stabilized coating. It looks good and is resistant to fading. As you’d expect, it’s waterproof and won’t allow dust to reach your grill. And its heavy weight means it won’t easily be whipped around by the wind. The Ravenna comes in four sizes, from extra small to large, with widths ranging from 32 inches to 57 inches. Most built-in grills will fit somewhere between those measurements, but do check before you buy. A cute handle on either side is made of coordinating fabric with a chic stripe. The handles are padded so they’re comfortable on your hands as you remove the cover. A snug fit is ensured by elasticated seams, each with a color-coordinated toggle to hold them in place. Air vents are positioned on either side of the cover, and are self-supporting to keep the air flowing. They’re angled downwards too, so you won’t have to worry about them letting in dust or rain. Classic Accessories make a whole host of coordinating covers. Whether you’re looking to protect your patio table, chairs, parasol or even outside lighting, there’s a cover to match. Put them all together, and your furniture will look almost as good covered up as it did open to the air. If you have a built-in grill and want a stylish and hard-wearing cover, you won’t find many better options. If you’re feeling a bit confused – don’t worry! We’re going to look at what to consider when choosing the best grill cover to meet your needs. So read on, and get ready to make the perfect purchase. It might sound obvious, but the first thing to think about is what kind of grill you need to cover. Do you have a standard gas grill? Or is it fueled by charcoal? Is it cart-style, or a kettle? Does it stand alone, or is it built into a cupboard unit or wall? The answer to those questions will tell you what basic shape grill cover you need. If you’re searching online, include the fuel source and style in the description. That will narrow down your results and stop you spending ages looking for covers that won’t fit your grill. Once you’ve answered that question, it’s time to look in more detail at the specific features of your grill. First of all, check the measurements – width, depth, and height. Then check them again. It’s easy to misread a tape measure, and just as easy to write down the wrong number. Make sure too that you’re measuring at the outer limits of the grill. If there’s a handle on the grill lid, make sure you measure from the very top. The same goes for handles at the sides. Make sure you include them in your width measurement. If your grill is a well-known brand, check the model number. Some covers state that they’ll fit specific models from brands like Weber or Char-Broil. They’ll give you a snug fit, minimizing the chances of rain and wind getting underneath them and damaging your grill. But you don’t necessarily have to pick a bespoke cover to get a great fit. Look for features that allow the cover to be customized to your grill. Seek out options with Velcro straps and elasticated hems. And check how much scope there is to cinch them in. Toggles on elastic are the most flexible option, as you can position the toggle wherever you need it. Straps with buckles can easily have an extra hole added if necessary. Velcro straps can, of course, only be fastened where there’s Velcro – so look for options with a large Velcro area. Does your garden bask in uninterrupted sunshine, with no shade to interrupt the rays? Or does your grill sit against a north-facing wall, never receiving direct sunlight? How much rain will your grill cover have to contend with? How cold does it get in winter? 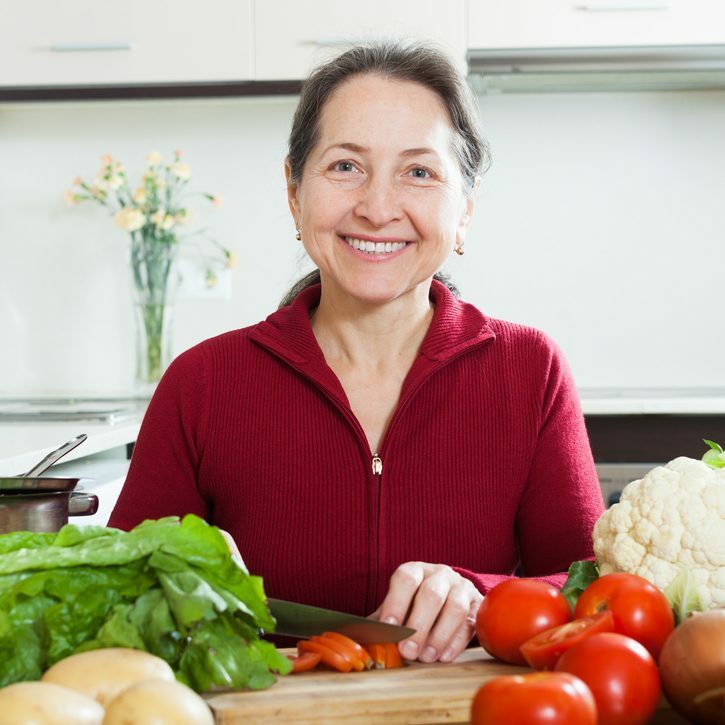 All these factors will influence the qualities you need from your grill cover. Fabrics exposed to strong heat can crack over time. And dark colors will fade if they’re left out in bright sunshine. 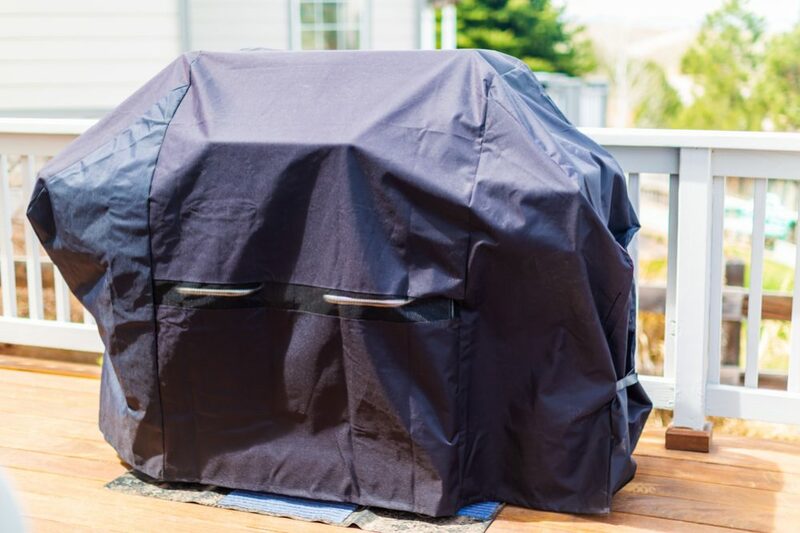 If you’re fortunate to enjoy a sunny garden, look for a grill cover that states it’s made of UV-resistant fabric. That will extend its life. And while fading colors won’t affect the performance of your grill cover, they will make it look a little dowdy. If your cover will be exposed to bright sunshine, look for a pale hue where fading will be less obvious. The Veranda grill cover from Classic Accessories is a great example of the design that works with all weather conditions. Most of it is made of pale cream fabric that won’t fade. At the bottom, though, there’s a darker band. That will hide any stains from water splashing up from the ground. Unless you live in the middle of the desert, you’re going to need a grill cover that’s waterproof. If you live in an area where there’s lots of rain, you might also want to consider one with air vents. That will help the flow of oxygen and prevent the mold and mildew that can form in damp conditions. Check the seams too. They’re an area of potential weakness in your cover. If they’re not sealed tightly, they’ll let in moisture or dust. So check how dense the stitches are. Some grill covers have multiple rows of stitching to help secure the seams. Others will have bonded seams. Take a close look and check the product description so you know what you’re getting. If you’re in an area that experiences cold temperatures, remember that water on the surface of your cover will freeze. So check the height of your grill and buy a cover that will clear the ground by an inch or so. That will stop the cover from freezing to the floor and ripping if it’s blown out of position. Last but not least, think about the wind. Reduce the risk of a sudden gust tearing your grill cover by choosing a close-fitting option. And look for something with straps and elastic to avoid the wind getting beneath a stray edge. There are an awful lot of plain black grill covers out there. If you want a minimalist look though, beware of garish logos. We love the King Kong cover, but not everyone wants a gorilla on their patio! If you’re looking for something really smart, check out the range from Classic Accessories. They’re reasonably hard wearing, and come in a range of attractive colors. And if you’re looking for matching covers for other garden furniture, they have a wide variety available. You might also want to check out instructions for cleaning. You don’t want to choose a great looking grill cover that never looks the same after the first rainfall! Look out for options that can be hosed down and left to dry in the sun. They’ll look good for much longer. Getting a cover over your grill isn’t always the easiest task. That’s the case even in good weather. Now picture trying to do it in the pouring rain and with the wind blowing a gale! Make your life easier by looking for options with handles. They’re a simple feature, but surprisingly not all grill covers have them. And they really can make a big difference to how long it takes to get your cover in place. And last but not least, check out the warranty that comes with your grill cover. Warranties can vary from a few months to several years. It can be worth paying a little extra to know you’re covered if the product doesn’t meet your expectations. We hope you’ve enjoyed our list of the best grill covers to protect your grill from the elements. We think they’re an excellent investment to keep your grill working well for longer. And with a huge range of options out there, you don’t need to spend a lot of money to get good quality. 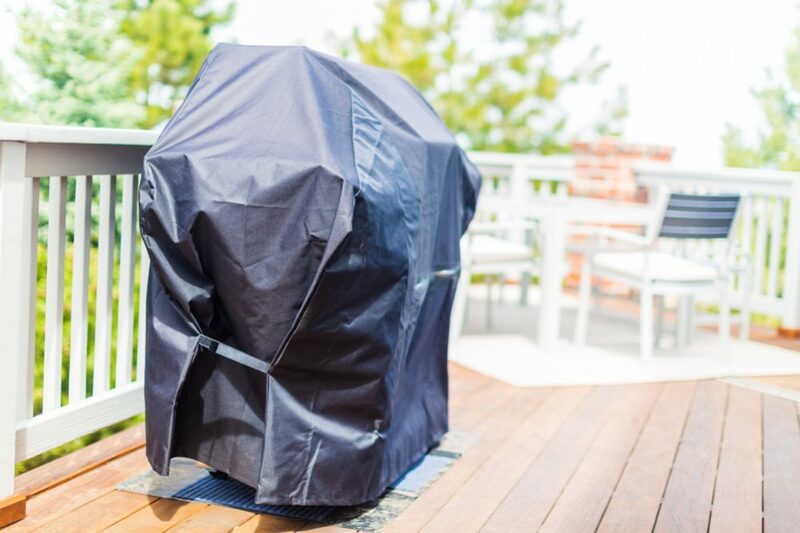 Our favorite is VicTsing’s waterproof grill cover. Its triple layer construction and bound seams will keep out every drop of rain and speck of dust. And all at a very reasonable price. Whichever cover you choose, you need never again cancel a barbecue because the winter weather has damaged your grill. We hope you enjoy many happy outdoor meals in the future!